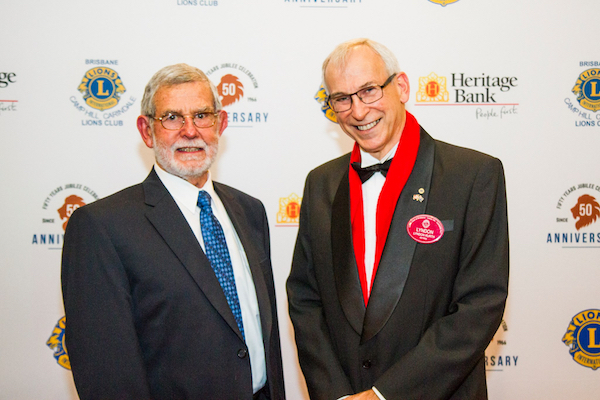 Almost 100 members and friends of the Lions Club of Camp Hill Carindale marked the club’s 50 year anniversary at a gala celebration dinner on Saturday 6 August. Glitz was the theme for the event, held at Upper Mt Gravatt’s Newnham Hotel, which linked the golden years of Lionism to the golden years of Hollywood. Lyndon Kurth, the club’s 51st President and a long-term Carindale resident, said members were proud of the club’s contribution over the last 50 years to help people in need in the local community and beyond. “I particularly commend previous management committees for maintaining a sustainable and effective local club over the last 50 years,” Mr Kurth said. The Lions Club of Brisbane Camp Hill Carindale was chartered in 1966 with a core group of local Carina businessmen. Local identity Jack Tobin, of WJ Tobin Real Estate, was the Charter President. In 2015, the club raised significant funds to support various community initiatives including drought relief activities in south-western Queensland; Community Friends, a group that provides food and support to people experiencing homelessness in Brisbane; youth projects that develop leadership and resilience in high school students; sight projects that recycle spectacles to aid those in need; and numerous medical research projects through various Lions Foundations. “A notable success of these foundations was the early assistance our Lions Medical Research Foundation provided to develop ground-breaking cervical cancer vaccine, Gardasil,” Mr Kurth said. At the anniversary celebration event, Past President David Greenup launched a special 50th anniversary initiative called the 50 Acts of Kindness Project with a budget of $5,000. Funds from the project will be available quarterly, with support of up to $1,000 per selected project that aids individuals or groups in the community, with potential for an additional $1,000 for outstanding projects. Special guests at the gala included Lions District Governor Graham Jackson and wife Denise, Club Charter Member Nev Kruger and wife Joy, and Nola Fields, wife of Club Charter Member, the late Bob Fields. Sponsors included Heritage Bank, Chris’s IGA Carina, RetireInvest and Member for Chatsworth, Steve Minnikin MP. Mr Kurth was elected as the club’s President in July 2016, having joined Lions after retiring from national research agency CSIRO in 2013. “I joined Lions because it provides both a social environment and the opportunity to help people who are in need in our community, while supporting development of young people who will be our leaders of tomorrow,” he said. Mr Kurth said the club’s members were proud to be part of the Lions Clubs International service network which includes more than 46,000 local clubs and 1.4 million members in over 200 countries worldwide. “We warmly welcome men and women over the age of 18 who are motivated to give back to the community and do something worthwhile in a social atmosphere to join us as members,” he said.